This year I’ve been trying out new recipes, workouts and crafts that I’ve found on Pinterest. I’m calling it my 2013 Pinterest Lifestyle Challenge. Follow along on Pinterest. 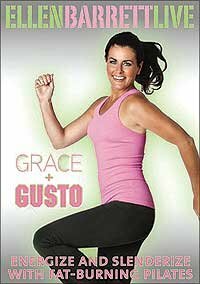 This month’s workout “Grace and Gusto” was discovered on Comcast’s OnDemand and so far, I totally love it. The tagline for the program is “Get beautifully toned and energized with this graceful fusion of Pilates and ballet basics.” You can read more about it on Amazon. I’ve had my challenges with Comcast and their billing and internet departments, so this is not an endorsement for the company per se, but I really like their fitness channel on OnDemand. There are a ton of options — cardio, dance, yoga, walking, weight loss, intervals, you name it, it’s there. The programs usually run for six months and they’re a great trial run for the real DVD or just a nice way to mix up at-home workouts. In January, I did a walking and weights program from Prevention magazine. Read about it here. I didn’t see the expected results, but it was a great workout for general fitness and exercise. I still enjoy the treadmill programs to switch things up. In February, I tried “Fab Ab February.” I paired the ab and push up exercises with intervals on the treadmill. I definitely saw a positive change in my upper body and core strength, but I managed to mess up my apparently-weak wrists. My wrists are improving, but they’re not back to where they were in January yet. Maybe in May? March was a little rough and I was supposed to do a “March Forward” type of program on the treadmill. I was really busy with work, prepping for interviews, switching jobs and enjoying spring break and I didn’t really get a chance to work out. Just another reason to give Grace and Gusto a real go!